It was during our 15th Anniversary Launch coverage in April 2007 that we discovered the updated park maps for the long-awaited celebration. With Disneyland Park bathed in gold and both parks sporting ’15’ symbols, confetti and streamers, they were a flashy welcome to the events that lay beyond the park gates. One year on, and ‘The Celebration Continues’ with a brand new redesign, bigger than before. 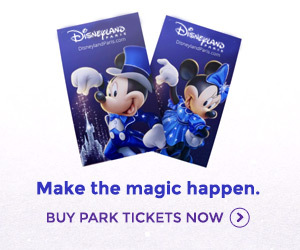 The covers of both guides have taken a darker approach with their pinks and blues fading to a neat black as rays of light shine out from each park logo. Mickey’s hand pulls the wrapping paper away in the bottom corner — the ’15’ now a much smaller icon in the lower right. They’re an improvement not just in the beauty stakes, with the cover information now displayed much more clearly in a single bar along the top, with both a larger and clearer country flag and textual language title identifying each guide either side of the date period. Inside, the maps are largely the same as ever. A few subtle tweaks have been made, however. In the excerpt from the Walt Disney Studios Park guide below, notice the small outline of the park and the colour fill showing the location of each land, just to make it even clearer. Of course, the new designated smoking areas are also marked — with a tiny cigarette symbol. Also note that the Walt Disney Studios Park map itself has again had a small design update — the addition of a large Stitch Live! attraction sign to the Walt Disney Television Studios building. And, whilst Jiminy Crickett is your guide to Disneyland Park, Stitch is now fittingly your host on the Studios’ map. The back cover of both park guides gives us one final surprise — an updated Official Partners list, now looking bigger than it has done for many years. New additions are Danone and Dole, which has been featured in-park for some time but never as an official parter. Kellogg’s is now a regular feature and IBM has returned following its disappearance several years ago. The Orange (sponsors of Studio Tram Tour) logo is now featured over France Télécom (sponsors of “it’s a small world”). Since they’re the same company, we’d assume this is simply because Orange is used worldwide and not just in France. Finally, the Extra Magic Hours leaflets available in the lobbies of Disney Hotels have also been given a refresh, with a smart new logo and simplified information now that the hours are strictly morning-only.